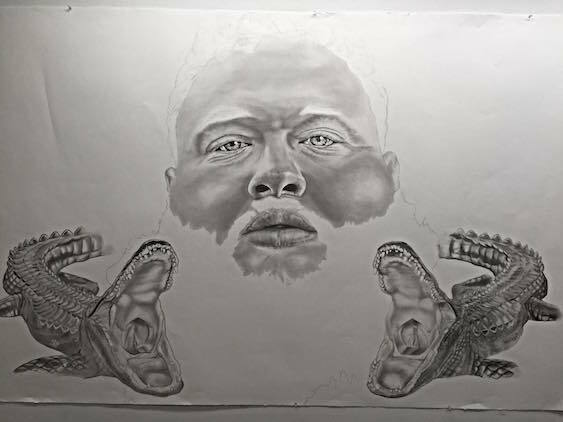 Toronto artist theQUEENthrone takes on the task of creating 6- and 7-foot tall graphite portraits of hip-hop stars like Outkast, Kanye West and Action Bronson that capture impeccable photorealism. That takes a lot of commitment—and arm strength. Check out her progress so far, and follow her Instagram for the latest updates on her projects. Pimps Are Kings. 6ft drawing I’m working on of Outkast. Graphite on Stonehenge. determined to finish this 6ft portrait of @kimkardashian & Kanye West. still very rough, needs about 60 more hrs of work.